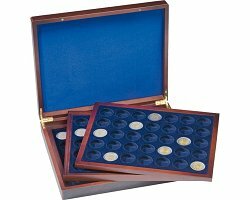 Wooden box for coins VOLTERRA TRIO de Luxe with 3 level for 105 coins. For 2€ coins in CAPS26 capsules. Coin capsules PREMIUM 26 mm. Wooden box VOLTERRA TRIO Luxe. 2€ in capsules, black.